There will be plenty of fireworks displays, parades and big-name concerts to celebrate the Fourth of July in central Ohio. Most events are free, but a few have an admission price (and are noted in parenthesis). • “Red, White & Boom!” takes place today from noon to 11 p.m. in the downtown riverfront and Arena District of Columbus. The 26-minute fireworks show starts at 10 p.m., and among this year’s stage entertainment is local band Pett Crow. For more information, visit www.redwhiteandboom.org. • As an alternative to Red, White & Boom!, Gahanna has its fourth annual Boom Fest from 6 to 11:30 p.m. today at the Golf Depot in Central Park (fees to park and children’s area). The fireworks will start around 9:45 p.m.
• July 4 events in Columbus include the Doo Dah Parade at 11 a.m. in the Short North, the Columbus Symphony’s Patriotic Pops concert at 8 p.m. in Columbus Commons (ticketed event), and fireworks following the Columbus Crew game (ticketed). • In Delaware, several events take place on July 4, starting with the parade at 1 p.m. At 4 p.m., the Ohio Machine will play the Rochester Rattlers in Selby Stadium (ticketed event). The Central Ohio Symphony will play a patriotic concert of American music at 7:30 p.m. in Phillips Glen behind Gray Chapel on the Ohio Wesleyan University campus. Fireworks will go off at 10 p.m. For more information, including street closures and parking, visit www.delawareohio.net. • In Sunbury, there will be the annual Independence Day Flea Market in the Square from 7 a.m. to 3 p.m. The “Star Spangled Banner” parade starts at 10 a.m. The fireworks display starts at 10 p.m. from Big Walnut High School. For more information, visit http://business.sunburybigwalnutchamber.com/events. 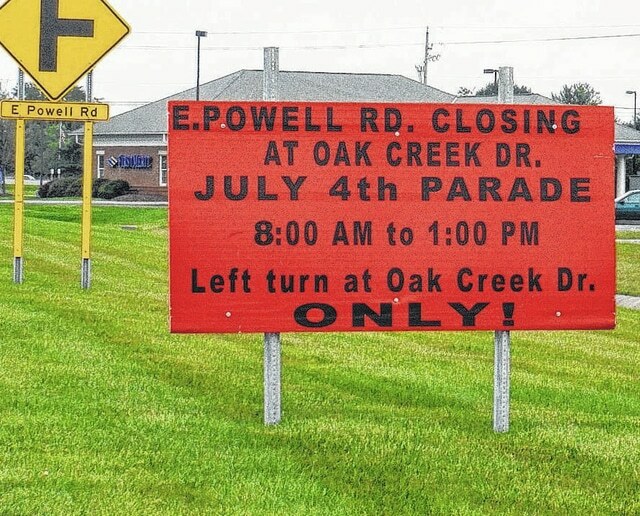 • The Orange Township parade starts at 10 a.m. New this year is the LC Summer Bash, starting at 4 p.m. in Olentangy High School Stadium, 675 Lewis Center Road. The ticketed event features a concert by pop star Gavin DeGraw, and fireworks launched at 10 p.m. For more information, visit lewiscenterba.com/4th. • Ostrander will celebrate “America’s Hometown Heroes” on July 4 with a parade at 10 a.m. and fireworks at dusk. For more information, www.ostranderohio.us. • Dublin’s Fourth events include the parade at 11 a.m., a concert by former Creedence Clearwater Revival frontman John Fogerty at 7:30 p.m. in Coffman High School stadium and fireworks at 9:50 p.m. For more information, visit dublinohiosua.gov. • Independence Day in Westerville features the annual Rotary parade at 1 p.m., concerts by the Westerville Symphony and McGuffey Lane at Westerville South High School, and fireworks at dusk. For more information, visit www.westerville.org. • Worthington will have a family picnic starting at 4 p.m. July 4 at Thomas Worthington High School, with fireworks beginning at 10 p.m. For more information, visit www.worthington.org/index.aspx.